After successful validation in India and 4 other countries, FinArt (automated expense & budget tracking app with data privacy controls) is now available in your region. Bangalore, India, January 27, 2019 --(PR.com)-- Just search for a personal expense tracker or a budget planning app on Google and you will be presented with plethora of options. There are dedicated apps for every possible situation; be it tracking of expenses, monthly budget planning, due bill reminders and so on. But are these apps really effective and relevant in today’s context? · Manual data entry was acceptable to us in past but not anymore; who has the time to sit and enter all the expenses manually? · Data privacy was never a concern earlier or rather we were not aware about privacy pitfalls. But year 2018 has taught us the real value and importance of data privacy. As the saying goes “necessity is the mother of invention.” FinArt, world’s most secure automated expense tracking and budget planning app is now available in all the countries. App had been live in India (and subsequently) in 4 other countries for last 3 years and has been improving its artificial intelligence & machine learning engine for this global launch covering MENA region, UAE, USA, Indonesia, Zimbabwe, Sri Lanka, South Africa, Hungary and several others. What is FinArt and how does it work? FinArt is a mobile app which helps users to track expenses, account balance, bills and monthly budget automatically based on SMS alerts received from banks, credit cards and billers. It also provides insightful reports and trends so users can drive real value & actionable from their data. When a user installs the app, it magically creates the statement of all accounts by just reading the local SMS inbox without any bank login/password. App also supports manual entries if user wishes to add any such as cash expenses. · No email or phone number based registration. 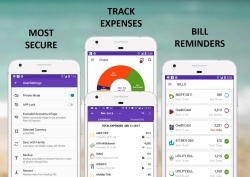 - Automatic Expense Tracking – App tracks all financial transactions including expenses, transfers, cashback/refunds etc automatically and presents the data in a very intuitive and smart charts. Similarly all pending bills are also tracked and timely reminders are given to users so that bills are paid by due date. - Effective budget planning – Any personal money management tool would be incomplete without the budget planning module. FinArt provides a robust budget planning tool wherein one can define the overall monthly spending limit or category specific limit. This budget tool can play very important role to meet your financial goals or pay off your debt. - Customization Controls – Each one of us has very unique requirements when it comes to money management tools. Someone who travels to multiple countries frequently and do spending in multiple currencies would like the tool to do currency conversion automatically. On the other hand, a couple may like to merge all their accounts at one place to have better visibility and control on their household expenses. FinArt seems to be addressing all these needs in one compact package and still maintains the simplicity. Does FinArt support my country/bank? FinArt is live in many countries and supports majority of the leading banks. If any of your banks is not supported, you can contact the support team and they will fix it within 24 hours. It’s time to take action, go ahead and checkout FinArt on Google play store.